A suspect who had claimed he had explosives on him is dead and all hostages have escaped without injury after a standoff at a Wells Fargo bank in Marietta, Georgia, near Atlanta, police said. The hostages -- two employees -- escaped the bank on their own, police said, and during the extraction of hostages, contact was made with the suspect, who was still inside. The suspect died after a three-hour negotiation, police said this afternoon. A member of the tactical team may have killed him, police said. The suspect had a backpack and authorities are trying to determine if there are explosives inside, police said. A robot is inside the bank now, police said. 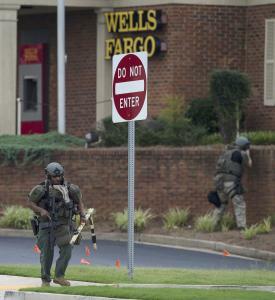 A hostage situation was reported at the Wells Fargo at 2675 Windy Hill Road in Marietta, July 7, 2017. The suspect had called authorities at 9:32 a.m. saying he was inside the bank. When he went inside, the suspect said he had an improvised explosive device and was prepared to use it, police said. Police said he made general threats and made demands throughout the morning. A hostage situation was reported at the Wells Fargo at 2675 Windy Hill Road in Marietta, Ga., July 7, 2017. The man believed to be the suspect spoke on the phone with the assignment desk at ABC Atlanta affiliate WSB-TV, the news outlet reported. Wells Fargo said in a statement, "We are deeply grateful to local law enforcement for their actions to secure the release of our team members today at our Windy Hill branch. We are also saddened that the events today ended in the death of the suspect. We are cooperating fully with the authorities in their investigation, and are referring all questions to the Cobb County Police Department in order to preserve the integrity of that work."